Enterprise architects are trained to understand business and IT infrastructures, but what about managers and other key decision makers? If they lack technical backgrounds, they may struggle to make the most informed decisions for positive organizational change. The ArchiMate modeling language solves this problem by presenting infrastructures as simple enterprise models, providing non-technically minded audiences with the perspective of enterprise architecture without requiring the training. This makes ArchiMate an excellent tool for enterprise architects, particularly those with TOGAF certifications (as both ArchiMate and TOGAF are maintained by The Open Group). In this video, Mike from Good e-Learning takes a look at ArchiMate, how it works and what advantages it can offer. Good e-Learning is a leading and award-winning provider of Enterprise Architecture courses, utilizing the latest online learning tools to keep students engaged and help them retain their new knowledge. Better yet, all of our courses provide 24/7 tutor support and mobile-accessibility, allowing students to study any time, anywhere. 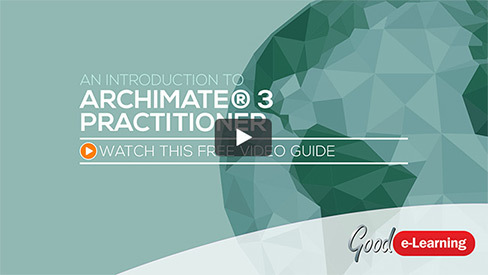 Our ArchiMate 3 Practitioner (level 1 & 2) course offers students a comprehensive guide to ArchiMate, as well as a FREE exam voucher for when they are ready to take the official examination. Certified ArchiMate practitioners can also make use of the ArchiMate 3 Bridging course in order to update their knowledge to ArchiMate 3. The TOGAF 9.2 Certification & ArchiMate 3 Practitioner Suite can upskill students in both TOGAF and ArchiMate, two vital tools for modern enterprise architecture.